Buddhist [Hindu?] hill altar at Oomga, Gya. bl.uk > Online Gallery Home	> Online exhibitions	> Asia, Pacific and Africa Collections	> Buddhist [Hindu?] hill altar at Oomga, Gya. 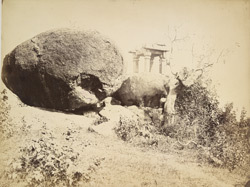 This photograph of a small stone pavilion, with a massive boulder in the foreground was taken by Thomas Fraser Peppé in 1870 and is part of the collection of Sir Richard Carnac Temple. Descriptive notes by Peppé accompanying the collection of photographs read as follows, 'Higher up the same hill...there is a curious little altar with a huge boulder alongside it. Under the boulder sacrifices of kids and other animals are still made. Every available ledge and spur on this hill seems to have been occupied by similar structures, and there are also a great number of figures and lingams both on this and adjoining hills'.